One of the biggest challenges within healthcare foodservice operations is ensuring that everyone who patronizes the cafeteria, from patients at the facility to doctors and staff to visitors, can find something they want to eat. Additionally, consumers are becoming increasingly aware of, and interested in, where their food comes from and what’s in it. For that reason, healthcare facilities should focus on highlighting food quality and promote transparency. 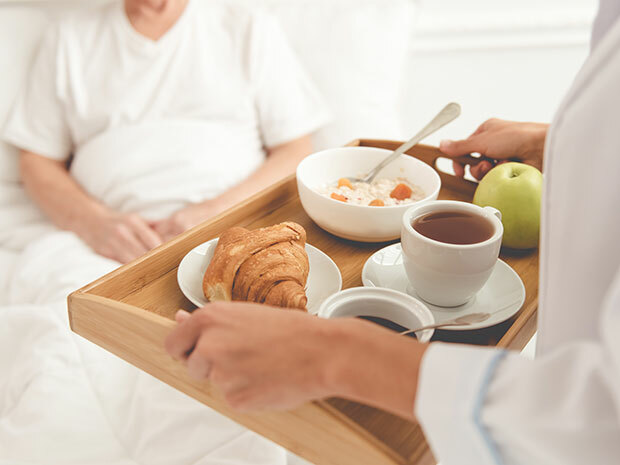 Beyond that, however, personalizing options at breakfast to ensure greater patient and patron satisfaction can translate to more food and beverage dollars from staff and visitors. Each type of consumer—staff, visitors and patients—has different demands for what they what to eat. Generational differences play into preferences, for starters. According to Smucker’s June 2016 Hospitals Trends Brief, a full 100% of mature consumers say that the taste of breakfast food and beverage is important, and 95% of this age group agree that convenience and ease of eating is important to them. First and foremost, therefore, hospital foodservice options should be tasty (and for older patrons, foods that are easy to eat should be considered). But not every foodservice patron is a patient. For those consumers, offering ample variety is key. While healthy options are what some consumers want, Smucker’s Hospitals Trend Brief finds that consumers were least likely to rank better-for-you breakfast as important compared to other qualities, like taste. That said, health is still important for many—84% of men and 78% of women say they value these options, and millennials ranked it higher than any other generation. And while better-for-you options are important, it’s safe to say that they still need to taste great in order for diners to order or purchase them. Foodservice success will be determined not by overall health, but by how enticing the meals are to diners. Luckily, healthy options can still be delicious. From clean ingredients to transparent sourcing to customization, it’s easy for operators to offer great tasting, healthy options. Consumers love being able to customize their meals—according to Technomic’s 2017 Breakfast report, 66% of consumers say they are more likely to purchase breakfast options that are customizable, and 22% are willing to pay more for them. Offering build-your-own options means that consumers can build a meal that matches their preferences, whether they’re looking for organic vegetables, cage-free eggs, all-natural meats or other ingredients that have no preservatives, artificial colors or sweeteners. Personalizing breakfasts is easy when foodservice operations offer a balance of traditional, emerging and ethnic dishes and flavors. For instance, some trending opportunities in healthcare foodservice include mashups, ancient grains, build-your-own breakfast sandwich bars and condiment bars. Mashups—traditional lunch or dinner preps combined with classic breakfast ingredients, such as a breakfast pizza topped with a fried egg—allow diners to get their favorite foods across the daypart spectrum and make it easy to try new and unexpected formats and flavors. Ancient grains and other superfoods make it easy to serve tasty better-for-you options. Multigrain waffles and pancakes are a great way to amp up the nutrition in the popular breakfast staples, and farro and quinoa are perfect substitutes for oatmeal in breakfast bowls. Customization is easier than ever with build-your-own stations, too. Whether it’s building their own breakfast bowls or their own breakfast sandwiches, choosing their own ingredients is a great way to entice diners by offering personalization. In that vein, one of the most cost-effective ways to offer personalized breakfast options is to offer an array of breakfast condiments for their meals, from different jams and spreads (including seasonal apple butter) to hot sauces (perfect for adding a spicy kick to ethnic dishes) to unexpected toppings such as peanut butter.